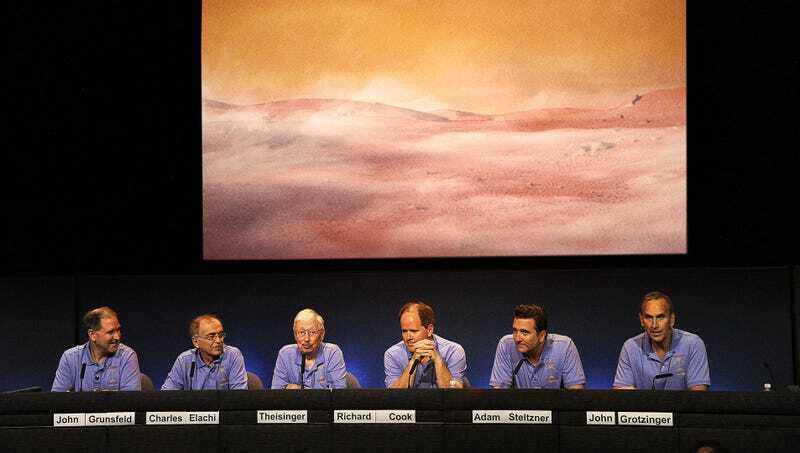 PASADENA, CA—Noting that the breakthrough finding could have major implications for future interplanetary celebrations, scientists announced Tuesday that the discovery of dry ice on Mars means the planet may one day be suitable for a Halloween party. “While we find no evidence that the Red Planet currently features the strobe lights and cobwebs necessary for transforming the space into something truly frightening, the presence of carbon dioxide in solid form, colloquially known as dry ice, suggests nothing is stopping us from one day having an extra-spooky Halloween party on Mars,” said Dr. Thomas Zurbuchen, Associate Administrator for NASA’s Science Mission Directorate, adding that with access to basic equipment such as plastic cauldrons or Jack-o’-lanterns, the eerie layer of fog produced by dry ice would help make for a real Martian Spooktacular. “For decades now, we’ve searched for evidence that Mars could one day support human seasonal celebrations, and the presence of dry ice on the surface gives us hope that we may one day experience a fully featured Halloween party complete with creepy music, skeletons, and scary ghosts. We already possess the technology to fit Dr. Demento’s entire discography into a standard Martian rover, and while it is far too cold on the surface to properly grow apples, let alone bob for them, we know it’s just a matter of time before we’re doing the Monster Mash up there.” When questioned, Dr. Zurbuchen cautioned that, no matter how advanced the terraforming of Mars becomes, it is never safe for anyone attending a Halloween celebration to handle dry ice without heavy protective gloves.